In 1969, San Diego celebrated its 200th Birthday, honoring the Spanish settlement and mission established in 1769 by Spanish soldier Gaspar de Portola and Roman Catholic padre Junípero Serra. Yet the man known as the Father of San Diego was not an 18th Century Spaniard at all, but a 19th Century American named Alonzo E. Horton. Horton, a San Francisco merchant, came to San Diego in 1867, almost 100 years after Portola and Serra. He immediately decided that the San Diego that had grown up around the first settlement was too far from the bay. Accordingly, he would buy land several miles south of that settlement and build a new San Diego. The townspeople scoffed. Seventeen years earlier, another man, William Heath Davis, had the same idea, tried it, and gave up in defeat two years later. But Horton was undaunted. He bought 960 acres of barren land for a then-generous price of $265 (an average of 27-½ cents per acre), and began to build his New Town. New Town had its economic ups and downs, and on one of the downs Horton himself lost almost all the money he had made, but the city persevered. The original San Diego settlement survives as Old Town, a restored reminder of Old California, but New Town is today's downtown San Diego. The decade of the 1960's brought a radical change to the downtown area -- its skyline began to sprout sleek modern high-rise buildings. 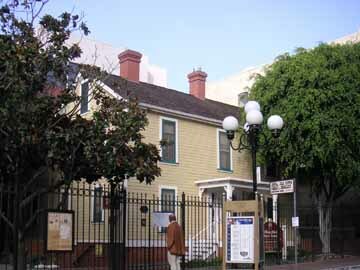 Yet some of the older "New Town" also remains, especially in the area today known as the Gaslamp Quarter. On a short walk through the heart of the city you can discover much of the best of both the old and the new. This walking tour takes a roughly chronological approach, beginning with a look at San Diego's early times and ending with more recent things. Distance: Approximately a mile and a half. Time: Two hours. 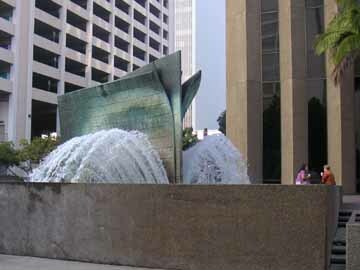 Begin your walking tour of downtown San Diego at Horton Plaza Park, on Broadway between Third and Fourth Avenues, on the north side of the Horton Plaza shopping center. Alonzo Horton was honest, straight-forward, and dedicated to San Diego. Immediately after buying the land for his new San Diego, he laid out its streets and lots and began to promote them. To get the ball rolling, he gave away free lots to every religious denomination that would build a church, and 20 more free lots to people who would agree to build houses. Houses, if you please, not shacks -- they had to be at least 12 feet wide, 16 feet long, and 12 feet high. He built a wharf at the foot of Fifth Avenue. Then, expecting that a railroad would soon connect San Diego with the East, bringing in tourists and settlers, he built a large 100-room hotel, the Horton House, on the north side of Broadway, across from the plaza where you are now standing. 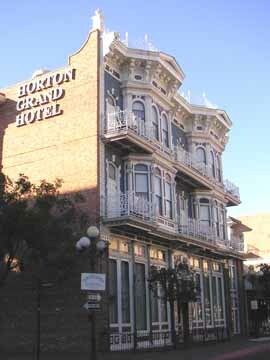 The hotel opened in 1870, just three years after Horton had first come to San Diego. For its time, the Horton House was lavish, offering in every room such amenities as carpets, marble top tables, and even a washstand with hot and cold running water. Horton was concerned enough about the view from his hotel that setting out a plaza in front of it was not enough -- he also widened Broadway, from the plaza to the waterfront, by twenty feet, thereby giving hotel guests a better view of the harbor. So although the Horton House no longer exists, Broadway still gets wider west of the plaza. In 1905 the Horton House was torn down to make way for the U.S. Grant Hotel, put up in honor of the Civil War general and U.S. President by his son, Ulysses S. Grant, Jr., a San Diego businessman. The U.S. Grant remains on the site, still a fine hotel. 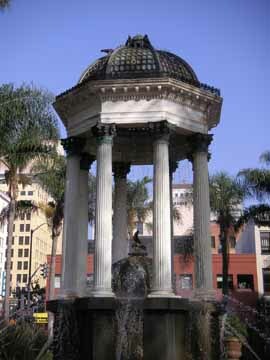 The fountain in Horton Plaza was put here to celebrate the opening of the U.S. Grant Hotel, and has bas reliefs of Cabrillo (the Portuguese explorer who discovered San Diego Bay), Father Serra, and Horton. When you have finished looking around the plaza, and perhaps stopping for a peek at the public rooms of the U.S. Grant Hotel, walk east, up Broadway. You will notice that the blocks are very short. Small blocks mean more corner lots, which always sell at a premium. With this in mind, "Corner Lot Horton" made his blocks 200 by 300 feet instead of the normal 300 by 600 feet. There are no alleys between the blocks because Horton thought that typically alleys only accumulated trash. Turn right at Fifth Avenue. You are entering the Gaslamp Quarter. In the late 19th Century, Fifth Avenue between Broadway and the waterfront was the main street of San Diego. 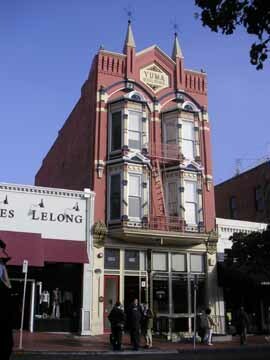 During the Twentieth Century, the charming Victorian buildings along Fifth Avenue fell into disrepair as the primary commercial center of town moved a few blocks north. Now the area has been rejuvenated, as building after building has been refurbished, repainted, and returned to its Victorian prime. The renovated buildings now house restaurants, offices, and shops. Diagonally across the street is the Horton Grand Hotel. (See photo at the top of this walk.) Today's hotel is a combination of two Victorian hotels. In Victorian times, the one on the left as you face the entrance was the Grand Hotel (later renamed the Horton Hotel), and the other was the Brooklyn Hotel, which later became a saddlery. When you have finished looking at the Horton Grand, retrace your steps along Island Ave., and continue up to Sixth Avenue, where you will turn left. Sixth Avenue contains a substantial amount of new construction, plus several 19th Century buildings that have been restored. Many of the historic buildings are identified by plaques that give information about their history. 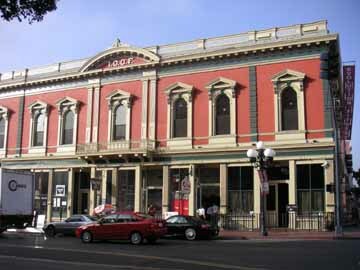 One of the best of the restored buildings is the I.O.O.F. 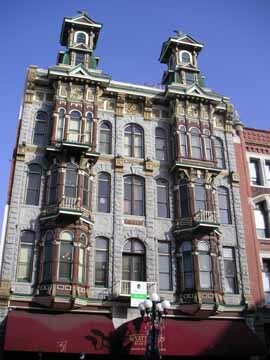 Building, built jointly by the Masonic and Odd Fellows Lodges in 1882 at the corner of Sixth and Market. Moving forward from the 19th Century, when you reach Broadway you will find the finest of the downtown buildings of the late 1920's. On the northwest corner, a Marriott Hotel occupies a handsome Romanesque revival building, originally built as a bank. The tan stone edifice sports ornate blue-painted ironwork and a red tile roof. Go inside to see the impressive main hall, its ornate painted ceiling, and the preserved touches of its former use as a bank. Downstairs, the bank's vaults and safety deposit room have been converted into meeting rooms. 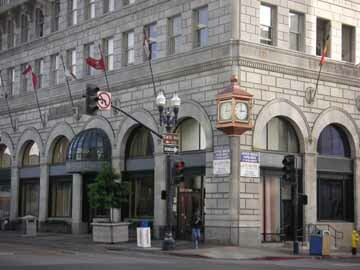 On the southeast corner of the intersection, covering a full block along Broadway, is the building originally known as the John D. Spreckels Building. Spreckels proceeded to finance the ventures that formed the economic backbone of San Diego. His first, a wharf for coal bunkers in 1888, preserved San Diego's only railroad link. (The Santa Fe Railroad Company, which ran a spur from Los Angeles to San Diego, was expecting to close the run for lack of a good fuel supply here.) He then went on to bail out the major showpiece and tourist attraction of the area, the foundering Hotel del Coronado. He bought a newspaper, The San Diego Union. He financed a dam and water company to bring in much-needed water, and he ran the San Diego Railway Company, providing transportation all over the city. He built theaters, office buildings (including this one), and hotels. And, as his crowning achievement, he financed the building of the San Diego and Arizona Railroad, bringing San Diego its own direct railroad link to the East. Turn left, walk up Sixth Avenue, and cross C Street. Two lines of the San Diego Trolley run along C Street from the Santa Fe Depot, San Diego's train station. The Blue line goes to the Mexican border, and the Orange line goes to El Cajon. A trip from downtown to the Mexican border takes about 45 minutes. When you reach B Street, turn left. You are now on the edge of the main financial district. A and B Streets are the home of many banks, brokerage offices, title insurance companies, and not surprisingly, high-rise buildings. Turn left and walk south. 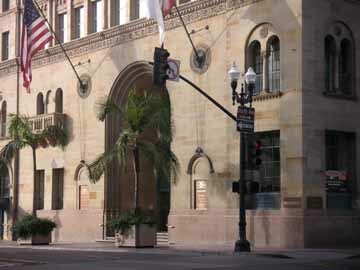 As you leave the plaza, you will pass under the City Administration Building, San Diego's City Hall. Leave the plaza by the C Street exit. Continue along Second Avenue to Broadway and turn right. On your left you will pass the Spreckels Theater, a neo-baroque theater built in 1912. Turn left at Front Street. The reddish-brown building on your right is the "new" U. S. Courthouse, built in 1974. 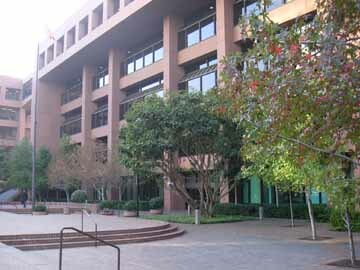 Continuing along Front Street, you pass under the Federal Building and find a small park. The high-rise building on your right, across Union Street, is the Metropolitan Correctional Center, a federal jail. The Spanish-style building on the block to the south of the jail is the former U. S. Courthouse. 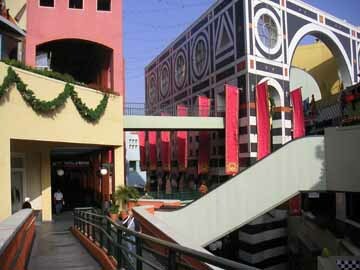 To the east, across First Avenue, is the Westfield Horton Plaza, a complex of shops, theaters, and restaurants. Turn left at F Street. Then cross First Avenue, and turn right. You'll be heading south (toward G Street). Part way down the block, turn left into the shopping center, where you'll be on the lowest of the center's five levels. Need a map for getting around the San Diego area? a pictorial map showing major roads and visitor attractions throughout San Diego County.